Monaco is so small, with many buildings, yet it has so many lovely gardens. 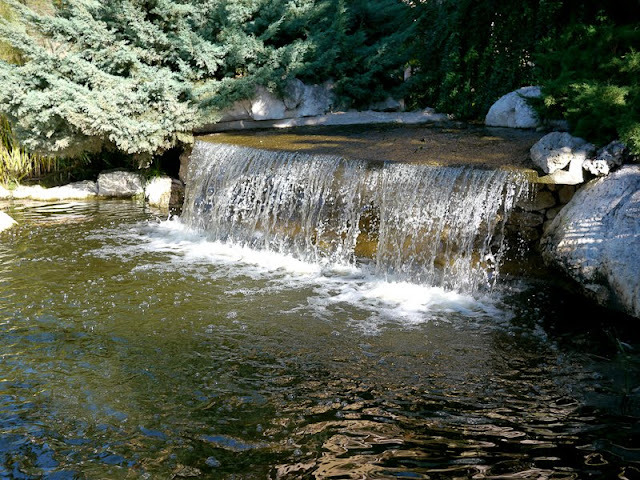 This waterfall is in a garden just behind the Heliport in Fontvieille and very near to the Princess Grace Rose Garden. A small bridge crosses this water - a good place to stop and ponder the world when you want to get off it. I hope not too many people read your lovely comments and see that beautiful waterfall or I am afraid it will be real crowded with us all sitting there contemplating peace and joy. Is this near "La grande laveuse", the sculpture of "The washer"?? Barbara, yes, it's the other side of the bridge. I took photos when the water was full of soap suds. Bad news for the ducks and fish. We stayed in Fontvielle for a week (actually, at the Marriott across the street in Cap d'Ail) and we walked through this area during our one visit to Monaco 8 years ago, but I never saw this spot. Oh well, I guess our absence helped provide the desired solitoude for others. i agree with you about the gardens. I especially liked the garden walk on the bluff overlooking the sea from the oceanographic institute towards the cathedral. Idyllic. Found a place like this here as well, this afternoon, 100 meters away from the tourist bustle.